STERRY, PETER (d. 1672), chaplain to Cromwell, born in Surrey, entered Emmanuel College, Cambridge, on 21 Oct. 1629, and graduated B.A. in 1633, and M.A. 1637. He was elected a fellow in 1636. He became a preacher in London, and was one of the fourteen divines nominated for the Westminster assembly by the House of Lords in May 1642. The omission of his name from the ordinance of June 1643 is probably accidental, as Sterry was serving on a committee of the assembly in August 1645. Sterry had been known at Cambridge as one of the platonists, and in London he was characterised by Sir Benjamin Rudyerd (q.v.) and others as mystical and obscure. He was intimate with Sir Henry Vane, the younger (q.v. ), and Baxter, who calls Vane's followers 'Vanists', puns on their friendship, asking 'whether vanity and sterility had ever been more happily conjoined'. On 24 Jan. 1644, while he was chaplain to Lady Brooke, Sterry was examined concerning some supposed plot of Vane, which Lord Lovelace was sent by the king to investigate (Hist. MSS. Comm. 6th Rep. p.3). Immediately after the execution of the king, Sterry was voted a preacher to the council of state (16 Feb. 1649). A salary of 100 shillings a year was settled upon him, and he was ordered to commence Sunday sermons at Whitehall in November of the same year. By that time he had been granted lodgings at Whitehall, and the allowance was doubled. His duties were to preach on Sundays before Cromwell either at Whitehall or Hampton Court, on every other Thursday morning at the former, and frequently before the lords and commons. He was employed to make an inventory of the state records for the Commonwealth, 'so that they may not be embezzled', to certify of the fitness of ministers, and to report on some works in manuscript which the council decided to print (Cal. State Papers, 1653-4, p. 225) He was also commissioned (in 1656) to examine Archbishop Ussher's library, and advise what books should be bought by the state (ib. 1655-6, p.370). Sterry's attachment to the Protector was sincere, if at times somewhat fulsomely expressed. On the news of Cromwell's death being brought to the chaplains assembled to pray for him, he assured them it was good news, for if he had been so useful in a mortal state, how much more so would he be when translated! 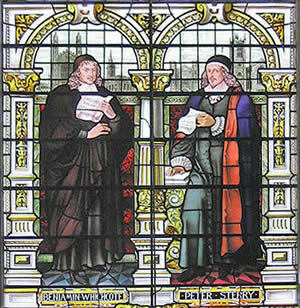 His prayer for Richard Cromwell that he might be made the 'brightness of his father's glory and the express image of his person' was regarded by Burnet as nothing short of blasphemy. (Hist. of his Own Time, i. 141). Baillie (Letters, ii. 429) says that after Cromwell's death he was out of favour, and regarded as a parasite. He continued to live in London, took pupils, for whom he prepared a catechism (Preface to his Appearance of God to Man), and after the Restoration held a conventicle. Apparently his later years were occupied with literary work. He paraphrased the Canticles, and dictated from his sick-bed a 'Discourse on the Mystery of Love and Wrath.' He died, after a long illness,on 19 Nov. 1672. Besides many other sermons preached before the lords and commons, in St Paul's, Covent Garden, St Margaret's, and elsewhere, Sterry published: 1. 'The Spirit's Conviction of Sinne,' London, 1645, 4to; another copy of the same date has the title, 'The Spirit Convincing of Sinne.' 2. 'England's Deliverance from the Northern Presbytery compared with its Deliverance from the Roman Papacy,' London (printed at Leith), 1652, 4to. A rare Epistle' was sent to him by David Brown of Soho, concerning a disturbance made by a woman while Sterry was preaching at Whitehall, to which a satisfactory answer was returned, and the correspondence published, 'Cloathing for the Naked,' 1652, 4to. Posthumously were published: 1 'Discourse of the Freedom of the Will,' London, 1675, fol.2 'The Rise, Race, and Royalty of the Kingdom of God in the Soul of Man,' London, 1683, 4to. 3. 'The Appearance of God to Man in the Gospel and Gospel Change,' London, 1710, 4to. This contained miscellaneous works, and an announcement that part ii. (which does not seem to have been published) would contain 'A Discourse of Vertue. That an Eternity of Duration having a beginning without end is expos'd to Difficulties. Of the state of the Wicked after Death and of the Divine Wrath and of the Devil. Short essays on A Spirit, Memory, A Plant, the Consort of Musick,' c. 'Prayers selected from Thomas a Kempis, Everard, Law, and (chiefly) Peter Sterry, appeared 1785, 8vo, and a sermon of Sterry's was republished in 'Fourteen Sermons,' 1831, 12mo. Some unpublished manuscripts are in the possession of a descendant, Mrs Wynter, residing at Wodville, Taunton. They consist chiefly of papers and sermons treating of philosophical and metaphysical subjects, together with a number of letters and autobiographical fragments. An interesting link to some modern observations on Peter Sterry's sermons was kindly contributed by Barry Sterry.